Featuring an insider’s attitude to filmmaking, a wry wit and an all-star cast, Paris – When It Sizzles nevertheless fails to be as appealing as other films in the Audrey Hepburn oeuvre. Perhaps it is the lack of plot? Or just the behind the scenes tension between Hepburn and William Holden? Whatever is lacking, it is enjoyable in a mindless way, just as it is. Pairing Holden and Hepburn together again after the success of Sabrina in 1954 should have been an easy way to inject a light-hearted familiarity into Paris – When It Sizzles, but evidently Holden’s worsening drinking problem – and his unrequited passion for Hepburn – caused significant tension. Not that one could tell by the performance of Hepburn, who brings her usual bright comic demeanor to an unchallenging role. Hepburn plays Gabrielle Simpson, an American stenographer living in Paris, hired by screenwriter Richard Benson (Holden) to assist him in the task of completing a 138-page screenplay in the two days of the Bastille Day weekend. He has been living the high life, drinking, carousing, gambling, and not doing the work he has been paid up-front to do by his patron, film Producer Alexander Meyerheim (Noel Coward). The ensuing time is spent inside his apartment, frantically fleshing out the barebones of an idea for a film called ‘The Girl Who Stole the Eiffel Tower’ and falling passionately in love. Benson’s alcoholic haze prevents him from much original thought, and it comes to Simpson to save the day, and the man. The trick here – and we are told by Benson that writing an exciting screenplay is all about ‘the switch’, something that seems to have strongly influenced such filmmakers as M. Night Shyamalan – is that while Hepburn and Holden narrate their developing screenplay, they play their characters onscreen, and the film constantly flips back and forward between the real and the imagined storylines. That the imagined reflects what is developing between them in reality is the plot device that allows us to believe their love story. In truth, none of this really works, and what is left is a bit of a misguided mess. Holden and Hepburn never really connect in the way stars of a romantic comedy are required to, and the ‘switch on a switch’ all beomces a bit messy. It seems the interplay between the real and fantasy worlds is simply a diversion from the lack of depth of the story itself. Hepburn and Holden are both adequate, with Hepburn in particular bringing her usual joie de vivre – she is always appealing on screen, and in spite of the many failings of Paris – When It Sizzles, it remains a joy to watch her performance. Holden is charming in parts, but certainly doesn’t live in his role in the way he did in the excellent Sabrina. There are many celebrity cameos, including Tony Curtis in a slightly larger role, Marlene Dietrich and Hepburn’s husband at the time, Mel Ferrer. Sinatra and Astaire sing on the soundtrack. 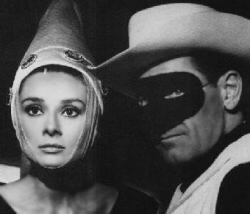 References are made in the script to previous films – in particular one amusing discussion between Holden and Hepburn of the plot points of the vastly better, (but unnamed in the film), Breakfast at Tiffany’s. Sadly, the injection of all of these elements never lifts this film above its inadequate plot and unneccessarily confusing style of story-telling. This entry was posted in Film Reviews and tagged Classic, Romantic Comedy by Mark Lavercombe. Bookmark the permalink.